On September 16th, 2009 I won a prize from Linea Pelle's "Be a Celebrity Experience" contest. 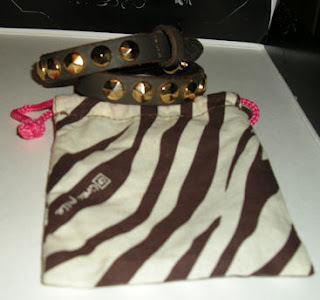 The prize was a bracelet which arrived on December 31st, 2009. The prize that arrived is more a cuff than a bracelet but either way it's a cute accessory. 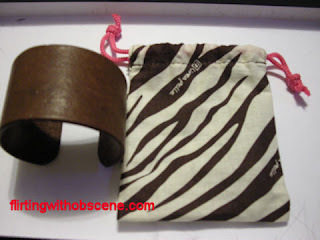 What I think adds to the cute factor is the dust bag the cuff comes with. There's a fabulous promotion currently running on Linea Pelle's Facebook page. People who take a picture with any of their Linea Pelle products (such as belts, bags, bracelets, purse lights, wallets, etc.) get the opportunity to receive a FREE GIFT! I had to take advantage of this since I am a brand new owner of a Linea Pelle bracelet. 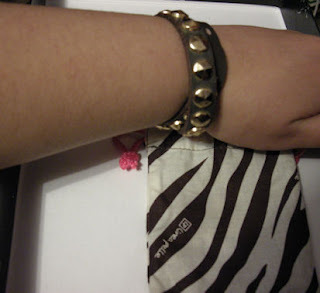 On Saturday, January 9th, 2010, I took a picture of me wearing the bracelet and holding the dust bag. On Monday, January 11th, 2010, I received a message on Facebook from Linea Pelle thanking me for posting the picture. They asked for my shipping info so they could send me a free gift! I was expecting the gift to come either in a few weeks or next month but to my surprise it arrived today via Fedex. 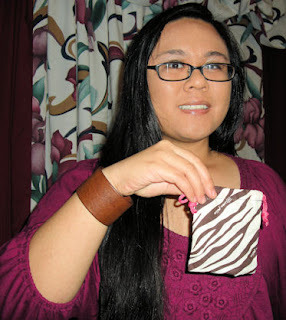 I opened up the box and was met with the signature zebra print Linea Pelle tissue paper. 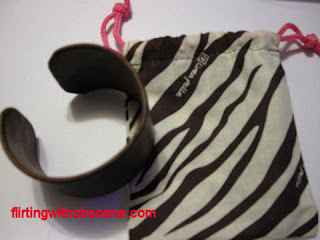 Underneath the tissue paper was a zebra print dust bag with a gorgeous bracelet inside. This gift from Linea Pelle is definitely more than I expected. It's very rare that a company can be so generous. Out of curiosity, I visited the Linea Pelle website to see if the bracelet was being sold at their online shop. It turns out the bracelet's official name is "Skinny Double-wrap Round Pyramid Stud Bracelet." The bracelet retailed for $55.00 but it's currently 25% off so the price is $41.25. What makes the bracelet even more special is it was featured in the "Get the look for under $100" feature in the February 2009 issue of Marie Claire's magazine. I like how the bracelet fits and feels around my wrist. I'll definitely rock it when I go out. Doesn't it look fabulous?